We had the pleasure of working with Jillian Harris of Jillian Harris Design, Inc, at the PNE (Pacific National Exhibition) in Vancouver, British Columbia this last month. The PNE is the largest annual exhibition in Canada, putting on an incredible show yearly since 1910. We were thrilled to be there, and thrilled to work with Jillian, who has her design firm in Vancouver. She was the interior design mastermind of the showcase home, the jewel in the crown of this exhibition. Some of you readers may recognize Jillian from her time on ABC’s “The Bachelor” and “The Bachelorette.” She’s a past co-host ABC’s “Extreme Make-Over, Home Edition,” and has another new Home TV Show launching in 2012. She is also a BIG Pendleton fan! Jillian artfully used our blankets, throws, towels, and dishes in a home that is natural, modern and sophisticated. Even a few items of iconic Pendleton apparel made it into the mix. This is a ski-in, ski-out home! You can see a nice video walk-through here. 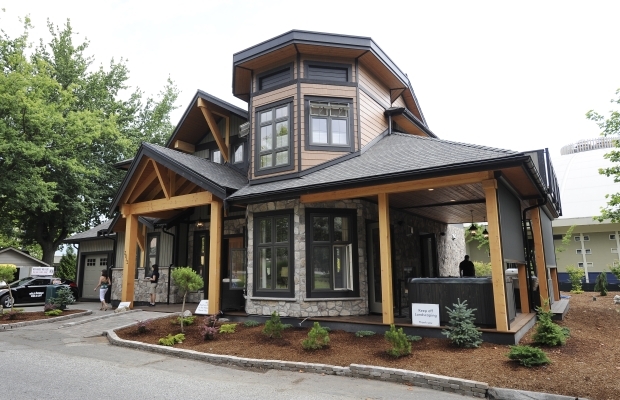 Over 100,000 people toured the Show Home, and it was featured nationally through several media channels – including print and TV. Those who entered the PNE’s sweepstakes are eligible to win the home itself! Yes! The home, the furnishings, all of it. Now, that’s a prize. The winner will be announced soon. Let’s take a look at their prize, shall we? ← As promised, the new Pendleton store at Portland International Airport.